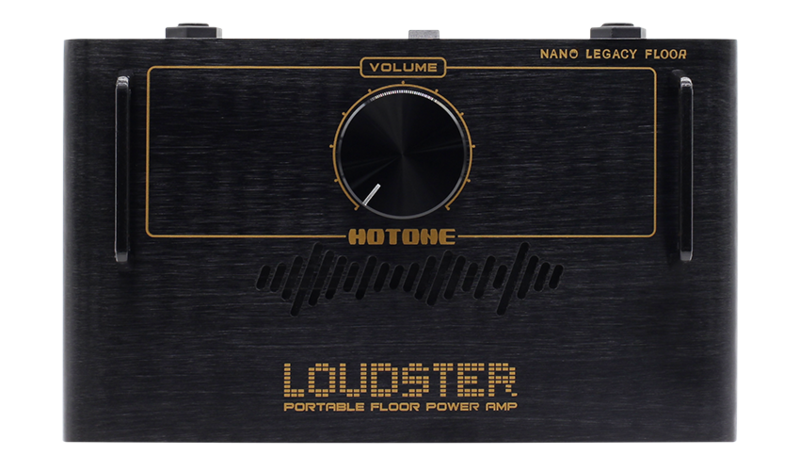 Loudster, Guitar Power Amplifier from Hotone Audio in the Nano Legacy Floor series. Although some may consider Hotone Audio’s Loudster a one-trick pony, it does its job exceptionally well and as intended. 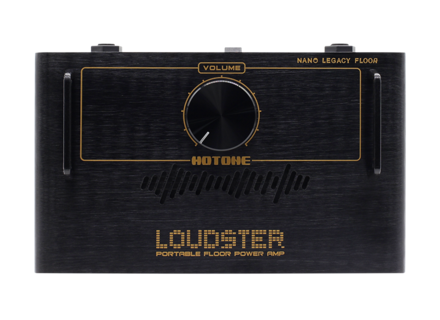 First, it enables you to work with pedals and preamps on a pedal board without having to haul around a full-sized amp head (the Loudster is the amp, and it sits nicely on the floor or on your pedal board). Second, the Loudster does not color your sound as an amp head would (each amp has its only tonal characteristics) – the Loudster has a high-quality tone and high input impedance to keep your tone as you originally intended. Third, it’s not just a volume/decibel increase that is produced, but high SPLs (sound pressure level), which gives that push or ‘oomph’ to speakers, which is what makes it seem so much louder. Power amps have been around for decades… Eddie Van Halen used them to drive his speakers harder. In essence, they are used to amplify low-power electronic audio signals (e.g., guitar pickups/preamp/amp modelers) to a level strong enough to drive loudspeakers/cabinets. Often power amps are sized to fill a space or two in a rack-mount unit. Hotone Audio has developed the Loudster, the middle man between your tone and speaker cab, which produces upward of 75 watts of power and plenty of SPLs to push loudspeakers and cabinets. This is important for those gigging or jamming who may like digital effects or perhaps some preamps/amp modelers, none of which likely have the ability to push speakers sufficiently to achieve optimum speaker performance and/or volume to be heard effectively over a drummer and other instruments. This has become a more important factor in the past few years as musicians desire to downsize what they have to lug around, and carrying a 15-pound amp head is not only cumbersome, but adds to the cost of the gear and can alter the much desired tone you achieved with other gear, e.g., preamps, distortion pedals, etc. If you’re looking to push the envelope in volume and speaker performance, whether plugging into the house’s loudspeakers or your own cabinet and while keeping a small footprint, the Loudster is an ideal consideration for about $199 USD. The Loudster is so simple, all you need to do is turn the volume knob. Perhaps there’s a bit more to it. Sitting at the end of your signal chain (just before any speakers) the Loudster needs to be turned on first and then turned off last, to help protect against any power surging or loud pops, etc., that may damage your speakers or other audio equipment. It’s also best to keep it dialed down all the way when doing this. This little powerhouse does come with its own power supply, since it necessitates 18-20v and 5A, which tells you how serious the Loudster is. As well, it is compatible with cabinets of different impedances ranging from 4-16Ω, and so you need only plug into any cabinet and you’re ready to go. You can place anything in front of it, including amp sims and preamps, distortion pedals, etc. The Loudster’s chassis is made of light-weight aluminum, measuring 4.75 x 7.50 inches (12.0 x 19.0 cm). There is no stomp switch to wear or break, but a power switch located in the back of the unit. There is no LED light on top, but rather there are lights that glow through the top grill to indicate that the unit is on (or off if you see nothing). All inputs and outputs are located in the back, which helps to prevent accidental stepping and strain at the input/output sites. The large volume knob feels like aluminum to the touch and is of good quality when turned (smooth). The little guard rails are a nice visual touch (to resemble common power amps with handles in a rack), but they do not serve a significant purpose beyond which to pick up the unit.